When Spring comes rolling around, I always expect a rash of calls from folks who are slated to deliver presentations at the regional and national conferences that proliferate at this time of year. Some people come to me with a high degree of preparation. Others, well… let’s just say they do what most people tend to do: Wait until the absolute last minute and throw something together in a panic. Here’s what I know for sure: Last-minute (or no) preparation doesn’t do you or your audience any good. It adds a degree of stress you don’t need. And it robs you of feeling the kind of confidence that can take your presentation from meh to marvelous. Begin. Now. Stop waiting around for creative lighting to strike or for the perfect time to begin. Stop making excuses and just start. To do that, follow the suggestions in step in # 2, below. Make strong choices and commit to them: Start by getting clear about what you’re there to do: What’s the underlying purpose or intention of your presentation? Once you’ve determined our intention, ask yourself “what 3-5 main points do I want to make in support of this intention?” Your intention and the main points you want to make form the foundation of your presentation. Next, choose the strongest and most memorable ways to make each one of those points stick (this is the content of your presentation). This can include stories, slides, videos, interactive exercises, you name it.) Then proceed to #3, below. Open and close with a bang: As a presentation coach, I am constantly dismayed by the wishy-washy choices people make around the way they begin or end their presentations. The fact is, your audience will most likely remember how you began (you’ll either hook ‘em or lose ‘em) and how you ended (because it’s the last thing they hear). So you’d better open and close in a memorable manner that sets you up for success. Here’s how to do that: When it comes to the opening, ask “How can I start your presentation in a way that gets my audience to sit up and take notice?” My three favorite ways to open are telling a story, making a startling statement or asking a titillating question that sets up the premise of your presentation. Whatever you choose to do, make it be something you’d enjoy doing. The more fun you’re having, the more fun your audience will have. When it comes to the closing, make sure you take the time to pull it all together by reminding your audience about the main points you just made. And consider ending with a strong call to action—something you want your audience to think about or do as a result of what you’ve shared with them. Tell more personal stories. Nothing is more memorable than a well-told personal story that makes your audience experience an honest-to-God feeling. So if you really want a point to stick, tell a vivid personal story illustrating that point. Rehearse. Out loud. Once you get the wireframe of your presentation together, do yourself and your audience a favor and rehearse your presentation until it becomes second nature. If you don’t need oodles of time in which to do this, commit to at least knowing the beginning, ending and any stories you might have included like the back of your hand. A good way to rehearse is to break the presentation up into chunks, and rehearsing the chunks out loud, in random order. A good time to rehearse is when you’re doing something totally mindless, like driving, washing the dishes, or vacuuming. But please do rehearse. Don’t let the first time you actually utter the words to your presentation be when you’re staring at your audience for the first time. 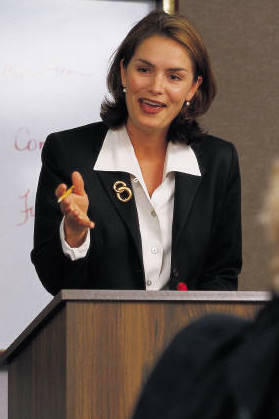 If you still need a kick in the pants to get moving on your presentation, consider hiring a presentation coach. You’d be surprised how helpful a few sessions with a professional (and the deadlines those sessions impose) can be to both the creation and refinement of your presentation—and to your state of mind.